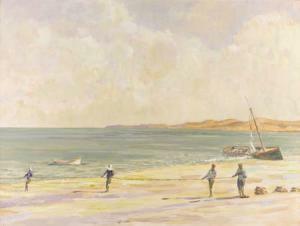 Find artworks, auction results, sale prices and pictures of Hazard Durfee at auctions worldwide. Hazard Durfee, a 1940 graduate of Yale University's Art School, has been exhibited at the Metropolitan Museum of Art, Newport Museum and has been included in the Whitney Museum's Biennial multiple times. His body of work consists of paintings featuring locations from Italian court yards and exotic Moroccan villages to the seaside life of his beloved Rhode Island (where he has lived since the late 1940s in the house where he was born). The painting being offered here features a group of fishermen along the coast in Tangiers and, as with most of his paintings, there is a great expanse of sky to draw the eye upwards from the activity in the foreground. Provenance: Arteam, Boston (1983) . Condition Report*: Normal signs of wear as appropriate with age.